Visit the showcase site for Concise History of Western Music. 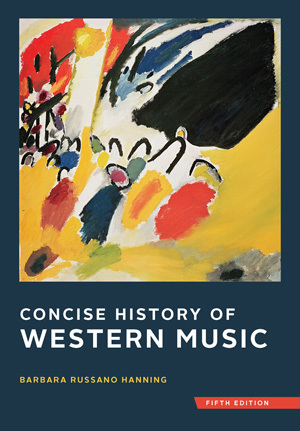 Barbara Hanning’s Concise History of Western Music offers students a manageable introduction to the forces that shaped music. Combining concision with the imaginative pedagogy that her text pioneered, Hanning focuses on an essential repertoire of 109 characteristic works—from the Middle Ages to the present—providing students with the cultural and historical context to illuminate the music and remember its significance. The new Total Access program unlocks a full suite of media resources with every new book, including instant access to streaming recordings of the complete Norton Anthology of Western Music repertoire, an ebook, audio for nearly every short example in the text, and stunning Metropolitan Opera video. The new Total Access program gives students premium streaming recordings of all 220 works in the Norton Anthology of Western Music, an ebook, video excerpts from the Metropolitan Opera, and a suite of tools for study and assessment—all included at no extra cost with the purchase of a new book. Drawing on decades of classroom experience teaching performers and liberal arts students, Hanning zooms in on the essential details that students need to know about musical works and styles, as well as the context in which they were created and heard. New for this edition the twentieth- and twenty-first-century chapters have been reorganized to highlight the connections between European and American modernists and enhance coverage of vernacular music and the music of the last fifteen years. The Fifth Edition maintains Hanning's tradition of innovative pedagogy. In part introductions, illuminating sidebars, and lavish illustrations, Hanning sets the music—along with its creators, performers, and consumers—in a broad social and historical context. New for this edition, more first-person quotations allow students to hear patrons and composers in their own voices, while redesigned Timelines and new At the Time boxes call attention to music's place in history. Finally, A Closer Look boxes unpack important genres, forms, and works, helping students to remember important details. To provide a focused introduction to music history, Hanning examines 109 works—selected from the broader Norton Anthology of Western Music—in depth, showing how they work and the ways they reflect the concerns and values of the age that produced them. For maximum flexibility, every work in the broader Norton Anthology of Western Music is briefly mentioned in the text and is available as a streaming recording via Total Access. A MP3-DVD of the Concise Repertory is available for students who want the recordings in a permanent format.